Table Salt | KönigsSalz. Weil Salz nicht gleich Salz ist. It is not known exactly in which millennium our ancestors first shouldered their pans and pickaxes to extract salt. However, historians agree that this was a magical moment that changed the course of history forever, as salt provided the prehistoric hunters and gatherers with valuable trace elements and minerals. “White gold” is what salt was referred to from ancient times until the 19th century. Its other name alludes to more than the great material value it once had. As an example, Hildegard von Bingen referred to the importance of salt for the body’s water balance, the nervous system, the digestion and the bone structure in her publications on healing. Along these lines, recommendations are also made in Islam: “Commence and end your meal with salt and you will be spared from 72 diseases and evils.” (Al-Ka¬fi, volume 6). To help us feel this healing energy that was served with food over millennia, we searched the world for the last natural salts – and made a spectacular discovery. We made a find in a valley in 3000 m altitude in the Andes Mountains, in the hills of northern Pakistan, the former Persia, and also in many mountain ranges in Europe. Each of these salts has a unique and distinctive taste, as each of them bears a different composition of minerals and trace elements. As an example, our KönigsSalz from the Alps has a remarkably high percentage of iron. It is quarried in Austria, only 50 km from the world’s oldest salt mine. 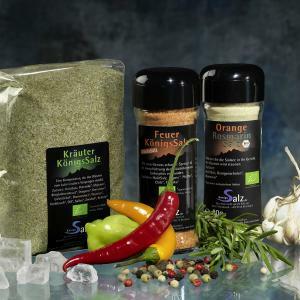 The tradition of infusing salt with herbs, garlic and spices goes back to the ancient herb women. They once prepared aromatic salts so that their aristocratic masters could take in a pinch of “medicine” with each meal. 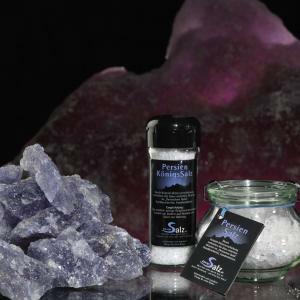 Salt does not only perfectly adopt the taste of the ingredients, but also the beneficial and invigorating essential oils. As our contribution to reviving this tradition, we added varieties of modern taste to the classic aromatic salts. Self-evidently, we use organic products whenever possible. KönigsSalz is a certified organic company according to DE-OEKO-001.